Located in the heart of downtown Duluth, the Sheraton Duluth Hotel is ideally situated for business, weekend getaways, or an extended vacation. We're connected via skyway to St. Mary's Duluth Clinic and Miller-Dwan Medical Center and are also just minutes from the Duluth Airport.Full of charm and ambience, our 147 guest rooms and suites give you everything you need for a great stay, from the Sheraton Sweet SleeperSM Bed to the flat screen TV, wired/wireless Internet, soft leather chair, and much more. For the comfort of our guests, we are a smoke-free hotel.Ease your tensions in our state-of-the-art fitness center. Swim a few laps in the heated indoor pool. Or simply relax in the whirlpool. The Lakewalk, located just a short walk away, offers a quiet place to enjoy the shore of Lake Superior.Welcome to one of the friendliest spots in the city. 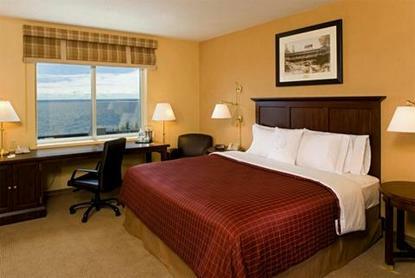 Welcome to the Sheraton Duluth Hotel.